Balloons & Chocolates-5 Mylar is a hand delivered gift. These gifts are delivered by one of our local design centers located throughout the United States and Canada. Same day delivery is available for most gifts when ordered before the cutoff time. The cutoff time for Balloons & Chocolates-5 Mylar is 2 PM in the recipient's time zone. I was last minute with sending birthday balloons and cookies to a favourite person of mine who lives in Vegas.. and today is his birthday. I'm in Canada and he posted on IG the balloons/cookies.. he was surely surprised and was smiling and that meant everything to me! Really happy.. will use again!! Thanks again!! Very happy with my order. Delivery was on time. The site is friendly user and the live chat helps a lot as well. Great selection and prizes. Thank you very much! The order couldn't have arrived at a better time. I live in Canada & my brother lives in Ohio. I was talking to him on the phone when the balloons & candy arrived. I really enjoyed my brother's reaction....just PERFECT! I have never been disappointed with the products or the service I have experienced dealing with GiftTree. 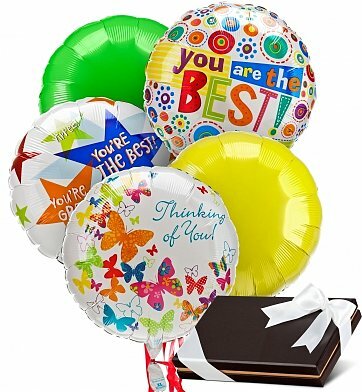 I ordered this bouquet balloons & Chocolates for my brother's 30th birthday. He lives in USA, but our parents and I are in Europe. This was the present we were looking for - delivering something happy. He was at the university at the time he got called for delivery, so he agreed to have a friend receive the order at home. A couple hours later he arrived home and found this bunch of colored balloons and a stylish box with chocolates... was surprised and happy that he can feel us thousands of miles away. Thank you gifttree! I'll be back to you surely!!!! Great service! My sister loved receiving this as a surprise delivery for her 30th birthday. She specifically said how flowers are nice, but this was so fun and different! It made Dad's whole day! Even though I didn't get to see it personally as I live out of state, I heard my Dad's joy and gratitude at the gift. He'd just been discharged from two months in hospital, and so this was a "welcome home" surprise. This was a great gift and she was very surprised and pleased! Get Well Balloons & Chocolates Made the Day! After a colleague's family came from hospital, they were greeted on their homecoming with this gift and it made his day! The chocolate included turned out to be a favorite of his and brightened an otherwise difficult time. This is the second time I have used this site to send a gift last minute. The balloons and chocolate that I ordered were delivered even before they were expected on the day I selected and my husband was in love with the chocolate. Thanks AGAIN for making someone's day special!! The recipients were completely delighted with their congratulatory balloons and candy. I thought it a lovely way to welcome 2 beautiful new American citizens and they obviously agreed. Thank you so much for making their smiles & tears possible on this most precious of days to them. A great gift for anyone you love, hand delivered when you can't be there. Great customer service! The person who received the balloons and chocolate were very happy with it. Thanks. Nice that you called to remind me of the event and offering a variety of choices, it made things so much easier. Easy to order and prompt delivery.